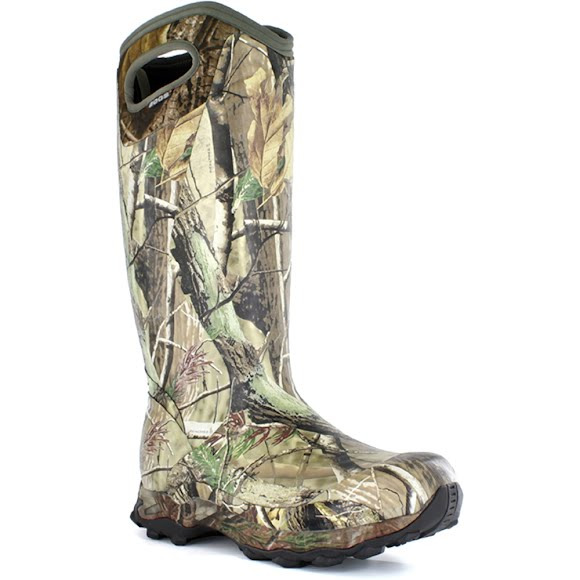 The 16" BOGS° Bowman offers durability and protection during the most rugged of hunting conditions. Lined with 6mm of Neo-Tech™ and our Bogs Max-Wick™ lining plus Airmesh to achieve warmth without bulk. The Bowman provides more insulation than other brands' "lite" boots while weighing in at a mere 2.6 lbs per boot. The heel kick on the back makes it easy to get them off. The 16" BOGS° Bowman offers durability and protection during the most rugged of hunting conditions. Lined with 6mm of Neo-Tech™ and our Bogs Max-Wick™ lining plus Airmesh to achieve warmth without bulk. The Bowman provides more insulation than other brands&apos; "lite" boots while weighing in at a mere 2.6 lbs per boot. The heel kick on the back makes it easy to get them off. This boot will keep you up and out of the cold. 100% satisfaction guaranteed. Neo-Tech™ Four-way stretch inner bootie provides insulation and comfort. Max-Wick™ lining plus Airmesh to achieve warmth without bulk. These boots are the most comfortable boots I have had. Light weight, warm, and flexible. Product was shipped the same day as I purchased it and was delivered within three days. Great deal on a great product!! These boots are a little more narrow than most but they fit me perfectly. These boots are the most comfortable boots ever. I am a woman and couldn't find a boot with good traction and came across these in a size 6 which works for a woman's 7.5. The are tall for Montana snow and excellent traction. They are not heavy. Very comfortable and plan to buy another pair for back up.